Welcome to Cornwallparalegal.com. I’m James Moak, and have been a paralegal for over 39 years. I’m very proud to announce that my son, Daniel M. Moak has joined our practice and will be providing a full range of paralegal services with an emphasis on Human Rights. We are licensed by the Law Society of Upper Canada, as such you can be assured of professional quality legal services. We would be pleased to assist you in whatever your legal needs may be. From the Kingston, Ottawa, Cornwall triangle I am here to serve you. Other areas upon request whether on a direct or agency basis. We also specialize in acting as agent for Law Firms, Paralegal Firms, Financial Institutions or other parties from outside our region.. Numerous agents available to assist you across the Province of Ontario. Paralegals now perform in many areas of the law, and you’d be surprised how we can assist you. Process Serving available throughout the Cornwall region. Cornwall Ontario – For Cornwall, Kingston, and now Ottawa Paralegal James Moak it’s been an interesting fight to see unauthorized practice by unlicensed people appearing before the Landlord & Tenant board of Ontario and other courts. He was recently featured in the LAW TIMES twice (HERE & HERE) The weekly news bible reviewed his battle that stems from the case LSUC v Chiarelli and paralegal regulation since its inception. Essentially Mr. Moak believes that Paralegals and Lawyers are the only people allowed to provide legal services. Legal services includes preparation and filing of documents and appearing for a party. The Law Society of Ontario and the Social Justice Tribunals Ontario have ignored this issue which places the general public at great risk. Members of LSO are held to a very high standard including qualifications, insurance, and ongoing training. Unlicensed people are not held accountable by any governing body or standards. Donna Mrvaljevic, a spokeswoman for the LTB, says the board asks representatives to include their law society number if they are filing an application on behalf of someone but that the absence of that number does not necessarily mean they do not have standing before the board. She pointed to an exemption for in-house legal services providers, which, she says, property managers often claim when appearing before the LTB. Mrvaljevic adds that the definition of a landlord in the Residential Tenancies Act is also very broad and includes the owner of a rental unit or anyone who permits occupancy of a rental unit. The Chiarelli case clearly states that only licensed people may represent and representing is defined clearly in the law society act. Contrary to Ms Mrvaljevic, she has totally continued to perpetuate incorrectly, the Chiarelli decision. In a nutshell, if you are not licensed as a paralegal or a lawyer thou shall not provide legal services as defined by the Law Society Act. The Social Justice ??? is mandated by the statutory powers and procedures act to control their own process which to date they are refusing to do. The Law Society of Ontario must step up and clearly state to the public that only licensed paralegals or lawyers may provide legal services and that this includes preparation of documents used in a proceeding as defined by the law society act. Too much time has passed with this issue being ignored by the powers that be. The real test of the depth of the problem would be litigation that arises from these matters, and Moak has raised a valid alarm about what could potentially transpire as a result. CFN – I’ve always been told that the law is a living thing and that by cases heard by learned judges case law develops into accepted practice. As our court systems become more and more bogged down, and less people can afford legal services, Paralegals have evolved here in Ontario and other jurisdictions and a case recently heard was a victory for them as the court system accepts them more and more with each passing year and helps defines their boundaries. With Small Claims courts now awarding amounts as high as $25,000 Paralegals are working on more complex cases. One of the areas of practice for them are landlord and tenant cases. While there’s a basic tenant in law that you can always represent yourself the definition of who can represent you legally just saw a victory for the Paralegal profession. 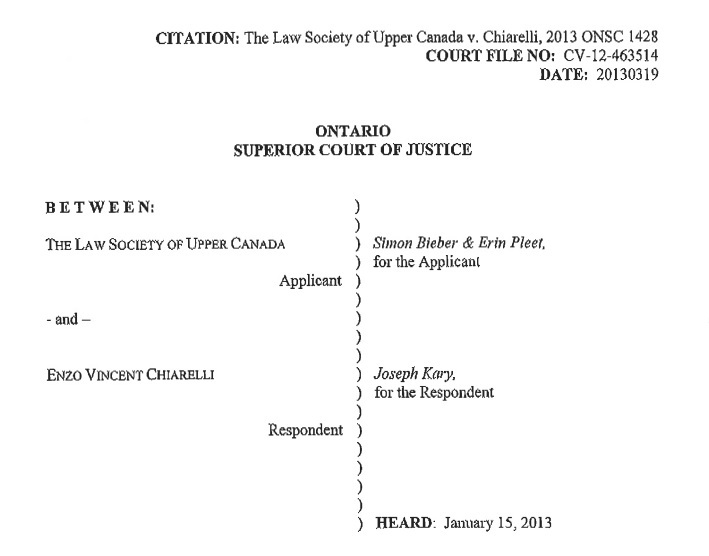 The Law Society of Upper Canada just saw such a victory in their case VS Enzo Vincent Chiarelli who was acting for a landlord, but was not a licensed Paralegal or lawyer. The key question in front of the Court was the definition of Landlord in regard to appearing in front of the Landlord and tenant Board. The grey area until now was the definition of Landlord and unlicensed people, usually property managers, were claiming they were exempt as they met the definition of Landlord. This decision clearly states that they meet the definition of landlord for the the purposes of collecting rents etc. BUT NOT EXEMPT AND NOT ALLOWED TO PROVIDE LEGAL SERVICES SPECIFICALLY ACTING FOR LANDLORDS AT THE BOARD. Paragraph 16 refers to Section 26.1 of Law Society Act which states only licensee shall provide legal services. Legal services is also defined. This decision also coins a new phrase- LICENSED LEGAL PROFESSIONAL- this puts Para Legals in the same class as Lawyers. The above question has been hanging around for five years and finally a binding decision has been made which will greatly help provide protection for the public from unlicensed people. The decision also extends to preparation of documents(notice of rent arrears etc) this meets definition of providing legal services-(LSUC ACT) this is very important for the profession as it will provide work for the many new graduates. Secondly it will provide much needed area of practice for paralegals especially the many new ones. It also will also stop unlicensed people from preparing the forms as this meets the definition of providing legal services. To learn more about Paralegals and some of the services they offer call one today!